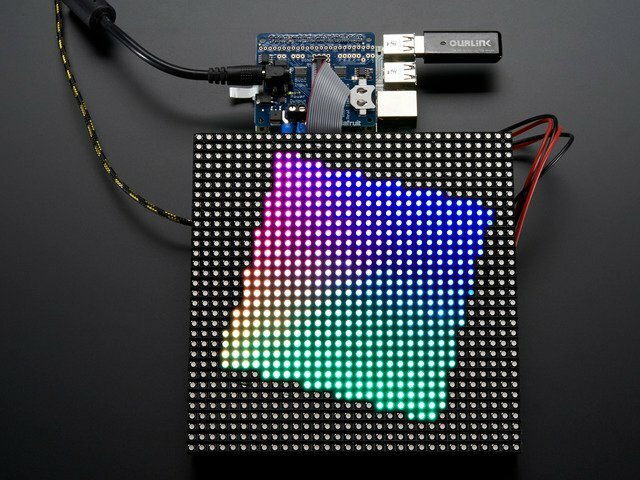 You can now create a dazzling display with your Raspberry Pi with the Adafruit RGB Matrix HAT or Bonnet. 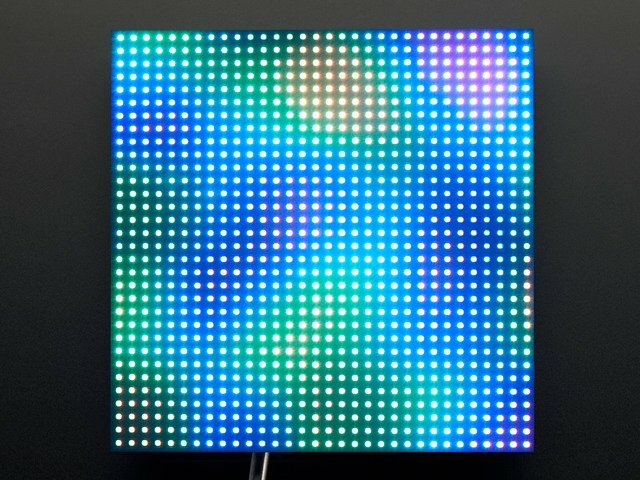 These boards plug into your Pi and makes it super easy to control RGB matrices such as those we stock in the shop and create a colorful scrolling display or mini LED wall with ease. 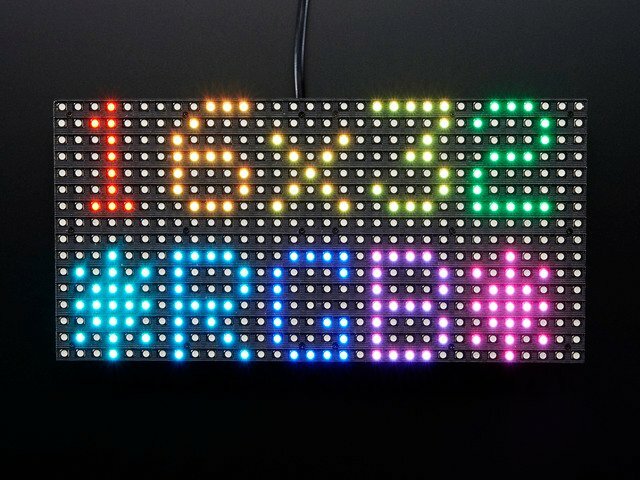 The RGB Matrix HAT works on any Raspberry Pi with a 40-pin GPIO header — Zero, Zero W/WH, Model A+, B+, Pi 2 and Pi 3. It does not work with older 26-pin boards like the original Model A or B. Note with the Pi Zero you may need to solder a header on the Pi board; it’s normally unpopulated on that model (except the “Zero WH”). 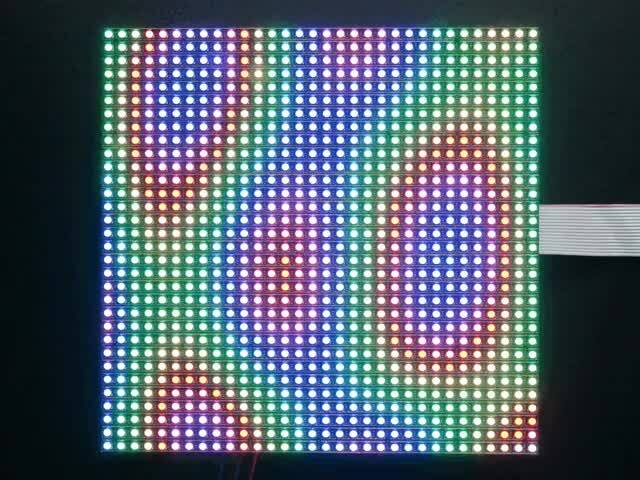 Works with any of our 16x32, 32x32 or 32x64 RGB LED Matrices with HUB75 connections. The latest “Rev C” HAT also supports 64x64 matrices by soldering a small jumper on the PCB. You can even chain multiple matrices together for a longer display - we've only tested up to 32x128 but it works just fine. The bigger the display the harder it is on the Pi, so keep that in mind if you're using a lower-powered Pi Zero. A 5V power supply is also required, not included, for power the matrix itself, the Pi cannot do it, to calculate the power, multiply the width of all the chained matrices * 0.12 Amps : A 32 pixel wide matrix can end up drawing 32*0.12 = 3.85A so pick up a 5V 4A power supply. Some light soldering is required to attach the headers to your Pi. A soldering iron and solder are required, but it’s a simple soldering job and most beginners can do it in about 15 minutes. This HAT uses a lot of pins to drive the RGB Matrix. You'll still have a couple left over but just be aware a majority are in use by the matrix. Unused GPIO pins include: RX, TX, 25, MOSI, MISO, SCLK, CE0, CE1, 19. 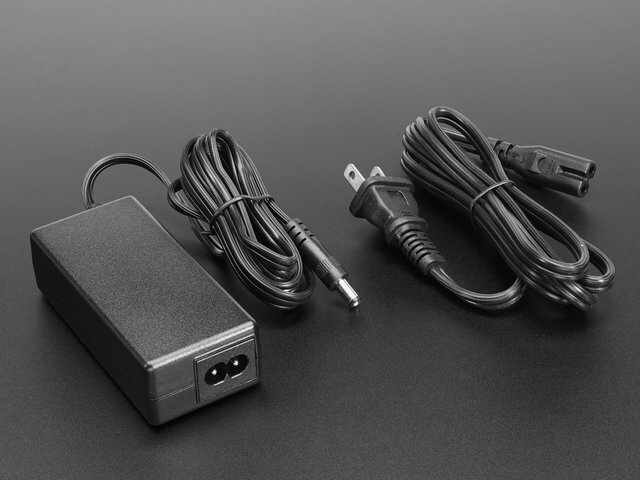 To use the Real Time Clock, a CR1220 3V lithium battery is required. We recommend powering your driving Raspberry Pi from the Pi's microUSB port but we do have a 1A diode on board that will automatically power the Pi if/when the voltage drops. 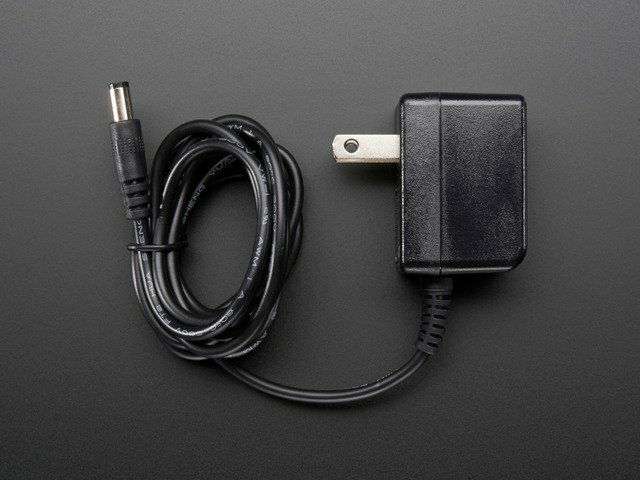 So if you want, just plug in the 5V wall adapter into the HAT and it will automagically power up the Pi too! The green LED next to the DC jack will indicate that the 5V power is good, make sure it is lit when trying to use the HAT! This pin is part of the 1->16 or 1->8 multiplexing circuitry. This pin is part of the 1->32 multiplexing circuitry. Used for 64-pixel tall displays only. Present on newer “Rev C” HATs only. Requires minor soldering, explained on next page. Before we can a-blinkin' there's a little soldering to be done. This step will attach the 2x20 socket header so that we can plug this HAT into a Raspberry Pi, the 2x8 header so we can plug the RGB matrix into the HAT, and a terminal block so you can power the matrix through the HAT. Start by plugging the 2x20 header into a Raspberry Pi, this will keep the header stable while you solder. Make sure the Pi is powered off! Solder the two big connections, use plenty of solder! Next up we will attach the 2x8 IDC header. Unlike the 2x20 header, this connector has a direction! Notice in the middle there's an outline for the connector in the middle. On the right it says HUB75 and on the left of the connector there is a little 'cutout' shape. This cutout shape must match up with the cut out on the connector. Flip the board around & solder up the other half! Check your work one last time...now continue to testing! 64x64 matrices are supported on the latest “Rev C” HATs only. Look for the Address E pads located between the HUB75 connector and Pi camera cutout. Melt a blob of solder between the center “E” pad the the “8” pad just above it (for 64x64 matrices in the Adafruit shop)…or the “16” pad below (rare, for some third-party 64x64 matrices…check datasheet). We had a little space and thought a real time clock would be a nice pairing for this HAT so we tossed on a DS1307 real time clock (RTC). This clock uses a 32.768KHz crystal and backup battery to let the HAT & Pi keep track of time even when power is lost and there's no network access. This makes it great for time displays! 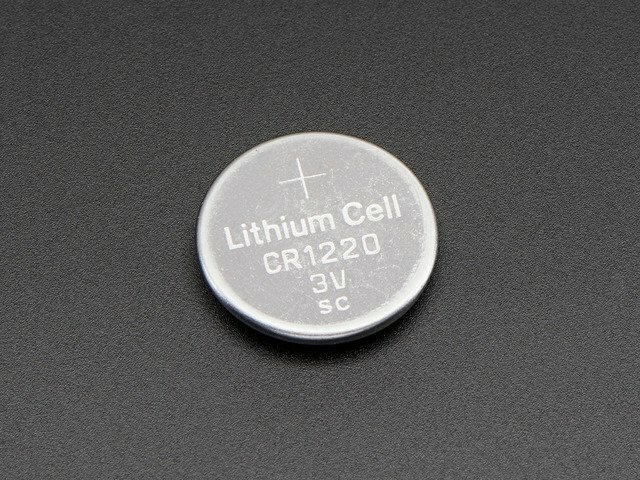 A 12mm 3V Lithium Coin Cell (CR1220) is REQUIRED to use the RTC! It will not work without one! The rgb-matrix.sh script already installed the necessary software to use the realtime clock…but you’ll need to set the initial time once. This is explained in the “Sync time from Pi to RTC” section of this DS1307 tutorial (just that one section…you can ignore the rest). This guide was first published on Jan 16, 2015. It was last updated on Jan 16, 2015.